Even more than their stalwart investigations of self and other, of death and the human relationship to nature, these two poets both search for poetry’s moral center. They recognize their kinship in their searching, although the poetic forms and the structures of thought are their own. 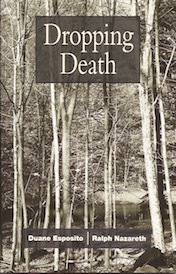 This abiding, this space for difference within one’s own poetic and ethical practice, is, if not all, then a significant part of what the book is about … And so poetry in Dropping Death can never just be a means of personal expression. It is always something more: it is an ethical action where another’s independent practice (and thus being), even while remaining discrete, becomes indistinguishable from one’s own. In Dropping Death, Ralph Nazareth and Duane Esposito juxtapose their very different work to create a many-layered dialogue about what it means to face, and make meaning from, our own mortality. From Esposito’s “Don’t you see? Nothing/but nature survives” to Nazareth’s “I found myself nailed to God in the web of my own making,” Dropping Death explores with dignity, courage, and even humor, the confrontation with what Kierkegaard called “the absolute” that awaits us all. In Dropping Death, Duane Esposito and Ralph Nazareth craft intimate journeys that run parallel and yet intersect. They each undertake willingly the long walk into the dark woods, without fear of getting lost, without need of finding truth, required of those who will confront themselves, their relationships, their faiths and most especially their mortality. This last they acknowledge while still insisting on being fully present in the complexity of this moment and on being open to the moment which may come next. DUANE ESPOSITO is a Professor of English at Nassau Community College. He has an MA from SUNY Brockport and an MFA from the University of Arizona. His work was selected by Diane Glancy for an Academy of American Poets Award and his poems have been published in dozens of journals. His collections are The Book of Bubba (Brown Dog Press, 1998), Cadillac Battleship (brokenTribe Press, 2005), Declaration for Your Bones (Yuganta Press, 2012), Dropping Death, a collaboration with Ralph Nazareth (Yuganta Press, 2018), and Panic’s Hymn, a reissue / re-imagining of Cadillac Battleship (GloveBox Poems, 2018). He lives on Long Island—on Lopsided Farm—with his wife, daughter, son, and many animals. RALPH NAZARETH is a poet and teacher. His book Ferrying Secrets was published by Yugadi Publishers, Hyderabad, India in 2005; Cristal: Poemas Selectos by Quirófones Editions in Ecuador in 2015; and Between Us the Long Road by Owlfeather Collective in 2017. His poetry has been heard and read in many parts of the world. He has taught for over four decades in schools, colleges, universities and maximum security prisons. The Managing Editor of Yuganta Press, he currently also heads GraceWorks, Inc., an international nonprofit charitable foundation. He lives with his wife Marianela Medrano in Stamford, CT.